Over the years, I’ve earned a reputation for being pretty masculine. Whether I’m out on my ranch roping steer, getting into any number of fist fights at tapas restaurants, or lifting heavy weights instead of taking a Pilates class, people have come to expect a certain level of unkempt, alpha-male rawness to my behavior. But, believe it or not…I’m actually kind of a softy. I demonstrated this in earnest this past week on vacation as I read One Day by David Nicholls. A friend recommended it to me, and so, due to a strange, inexplicable fault in my personality, I was immediately suspicious of it. In my defense, the cover did little to alleviate my trepidation. It appears, as you can see here, to be aimed squarely at 13-year-old girls. However, about three pages in, I was absolutely hooked. And I don’t mean normal person hooked here. I’m talking straight-up “book nerd on vacation” hooked, the kind of manic, borderline obsessive reading where you can simply do nothing but read because you absolutely have to know if these two charming Brits who don’t actually exist will ever get together. David Nicholls’ voice, style, and Britishness are addictive. 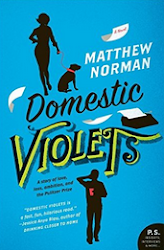 And the characters he’s created—particularly the two leads, charming Dexter and pretty, perpetually down-on-her-luck Emma—are so engaging that my emotions began to align with theirs in an unhealthy way. At one point, as I was lying on a beautiful beach sipping a Corona beside my wife in the middle of a weekday afternoon, I found myself feeling honest-to-God anxiety because Dexter’s mother was sick. And the end…oh, for the love of God. 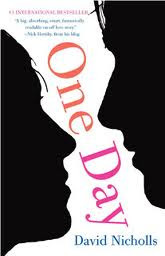 So, if you’re in the mood for a heart-aching romance—and a really great book—I highly recommend One Day. 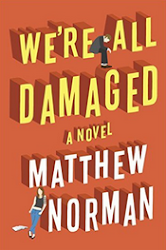 The novel’s architecure, which you’ll pick up on pretty quickly, is a little gimmicky, but the writing, characters, pacing, tone, and intelligence are so great, you’ll be too busy enjoying yourself to even care. I read this a few weeks ago and was just shy of really liking it. See, Emma was something else. Likeable and honest and funny and not put into the "sweet" box like so many female characters. But as a woman, Dexter was unbearable. Unbearable! And that meant that instead of rooting for the romance, I was kind of reading with one eye squinted thinking, "Oh, Emma, noooooo . . . "
Um. This sentence: "But as a woman, Dexter was unbearable" should say, "As a woman, I found Dexter unbearable." Though Dexter as a woman might have added something a little extra. Ahhh...the many trappings of punctuation. You raise a point. Dexter was a smug assface for a good bit of the book. But I think British dudes can pull that off because of the accent. I'm a complete anglophile, so I was bound to like it but I LOVED One Day. Fabulous read and of course I was not surprised to hear it had been optioned by Hollywood immediately. Just wondering who will play Emma and Dexter? It would be super annoying if they chose American actors with fake accents or moved the setting to the US. Kate Winslet too old? Too predictable? Same with Jude Law? Hey, Ryan's Sister. 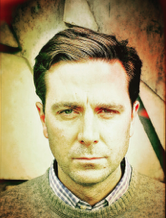 Check out IMDB.com. Anne Hathaway is Emma, and Jim Sturgess is Dexter. So, they got one legitimate Euro in there. Fish and Chips! The dimension of this merchandise is extremely unique.